I took a few attempts at writing a more intellectual review of Kong: Skull Island, as if that was a thing that could exist or needed to exist. The truth is that Kong: Skull Island itself doesn’t need to exist. But it’s here, and it’s big and loud, so how do we evaluate it? I suppose it depends on what you’re looking for. Lacking both the magic of the original and the pathos of Peter Jackson’s 2005 version, this Kong has more in common with the jungle B-adventures of the early 20th century: stock characters, obligatory thrills, little logic and less nuance. It’s a true Saturday matinee, a monster movie that occasionally raises the pulse as its likable cast sprints from one computer-generated sequence to another. Maybe you’re excited at the prospect of Warner Brothers and Legendary’s Expanded MUTO Universe; it’s a safer bet that without the post-credits brand extension, few would truly be excited to see the big ape back in action. Director Jordan Vogt-Roberts, the latest in a long line of men catapulted from a small debut indie to a studio tentpole, had his work cut out for him in reinvigorating the 80-year-old property. He and writers Dan Gilroy, Derek Connolly, and Max Borenstein (the last of which worked on the 2014 Godzilla reboot) make one smart — or at least interesting — choice right away in Kong’s 1973 setting. This time it’s not a film crew but a team of scientists, led by crackpot Bill Randa (John Goodman). They’re accompanied by a platoon of soldiers fresh off the end of the Vietnam War, led by Colonel Packard (Samuel L. Jackson). There’s the nervous one, and the stoic one, and the crazy one. 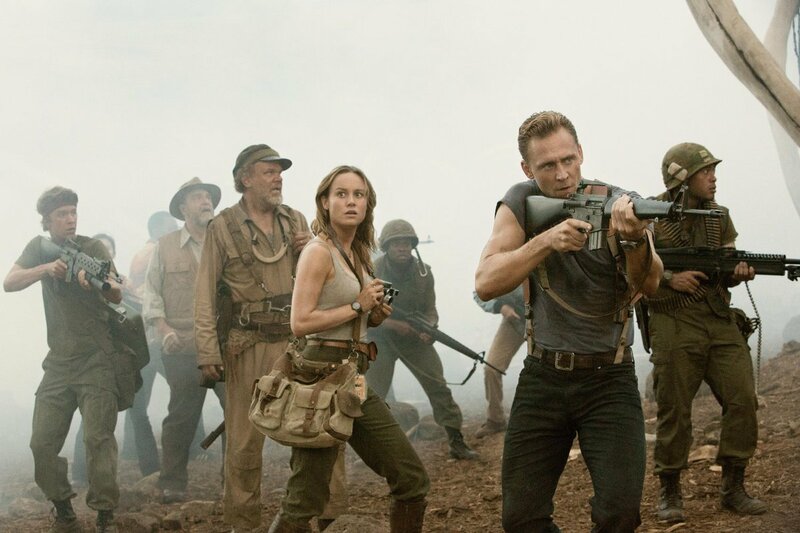 There’s a British mercenary (Tom Hiddleston), and a pretty war photographer (Brie Larson, her first film since winning that Oscar). The mission? Fly to this uncharted island and find out what makes it so special. What no one knows until they get there is that they’re all about to be monster fodder. At least Hiddleston got to show off his guns. Kong himself is a fine creation, a credit to the wizards at ILM as well as motion capture icon Terry Notary. He starred with Andy Serkis in the Apes films, but one supposes Serkis wasn’t keen to take another crack at the character. Unlike Jackson’s Kong, a massive silverback gorilla, Vogt-Roberts’ doesn’t have the same striking profile; he’s bipedal; he’s bigger and meaner. But because he doesn’t really form a relationship with any of the humans, it’s harder to form a relationship with him. Larson’s Mason Weaver does get to briefly “bond” — as in, not be killed — with the ape, but without the off-island climax that provides the emotional heft of previous versions, it’s all perfunctory. We were kept at a similar distance from Godzilla, but the big lizard was already a godlike figure. In Kong, we’re looking for flashes of humanity (ape-manity?) that never come, because there are too many skincrawlers to stomp. The film’s saving grace is John C. Reilly, appearing at the film’s midway point as if from another movie entirely. He plays Marlow, a pilot stranded on the island during WWII who has been accepted by the silent native tribe and understands the situation better than anyone. But Reilly plays Marlow as a goofball, a jolt of stuttering, comic energy just as the glower-off between Jackson and Hiddleston has reached its apex. Some of the better bits of throwaway comedy come from him asking about the state of the world thirty years later. The rest of the cast struggles with the tone in the early going, but once they get to act against Reilly, it snaps into place and we’re all more or less along for the ride. Kong’s not a bad guy, you see; he’s here to protect his people from the real monsters that come from below. From there, it’s a fairly predictable divergence between the characters that want to take down Kong because he’s there, and the ones who just want to get off the island, but again — at least — the film moves quickly, and provides a constant supply of “cool” imagery through its island setting, creepy creatures, and big balls of fire. Director of Photography Larry Fong, no stranger to jungle shoots from his days on Lost, practically turns the film’s palette bichromatic: all oranges and greens; swooping helicopter shots of hills and swamps; men stand on rocks, backlit by explosions; one unfortunate fellow gets torn apart by tiny flying dinos, silhouetted against the setting sun. Almost all of the best visual beats were in that terrific final trailer, which is a shame because the marketing (including the run of Apocalypse Now-inspired posters) also appeared to promise something more sophisticated than the final result. And though you might think there’s not a lot of room for inventiveness or risk-taking when you’re working with a franchise building block like Kong, the truth is that there was an opportunity here to deliver something better. Jackson can play this type of part in his sleep; Hiddleston is a straight line of serious all the way through; Larson gives more than the role deserves, considering she ends up having zero bearing on the plot. I couldn’t even tell you the names of the minor characters who get chomped, stomped, or consumed by fireballs. The ones lucky enough to survive helicopter crashes, gaseous clouds, giant bugs, and everything else while crossing from one end of the island to the other (without ever coming across any Kong-sized piles of poop) might have a colorful story to tell, but I only remember the shades, not the detail.